Reporting and remitting information for tobacco collectors and information for retailers on how to get a refund of the tobacco tax. In Alberta, generally tobacco tax is reported and remitted by licensed wholesalers and importers that are designated as tobacco collectors. The tobacco collector recovers the tobacco tax when the tobacco is sold, tax-included, to the next entity in the distribution chain. The purchase of tobacco, tax-included, and the recovery of the tobacco tax when the tobacco is resold, continues until the tobacco is sold to a consumer. Then the consumer pays the tobacco tax, which is included in the purchase price. Alberta retailers are generally not required to register or be licensed with the Government of Alberta to sell tobacco, unless they are located on a reserve or are a duty-free shop. Retailers are required to purchase all tobacco from wholesalers or importers licensed in Alberta. 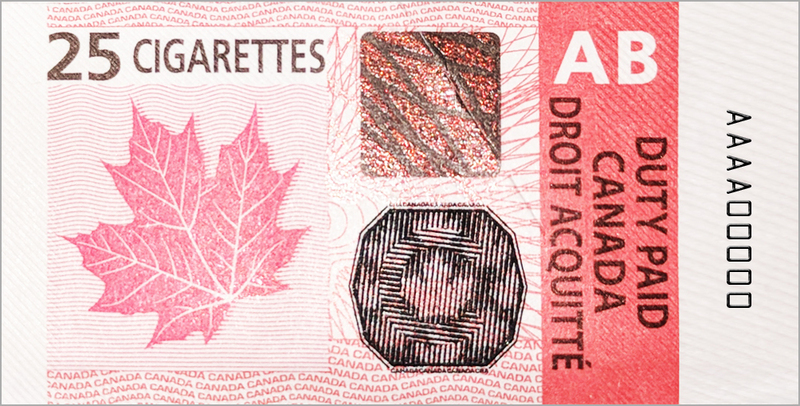 Each package, carton and case of cigarettes, tobacco sticks or fine cut tobacco for tax-paid sale in Alberta are required to be marked with the Alberta stamp (see example below). Cartons are marked with a stamp applied to or imprinted on, each end-sticker that seals the end flaps of the carton. The stamp has a red background in a black rectangle and “ALBERTA” printed in black. Cases are marked on two opposite sides with “ALBERTA” printed in black. Tobacco stamped or marked for sale in other provinces cannot be sold in Alberta. Manufacturers and importers can obtain Alberta stamps through the Canada Revenue Agency (CRA) using the established process to obtain federal excise (tobacco) stamps. More information on this process can be found by visiting CRA’s website. Pipe tobacco, cigars, loose tobacco and raw leaf tobacco intended for sale in Alberta are not marked with an Alberta stamp. However, they will still have a federal stamp. Alberta unmarked tobacco for sale must be purchased tax-included, unless sold to another Alberta licensed tobacco tax collector. Only Alberta Indian Tax Exemption (AITE) retailers and duty free shops can purchase black stock for sale to consumers in Alberta. Black stock may be exported to Canadian jurisdictions that do not have a provincial or territorial stamp. The Tobacco Tax Act requires all wholesalers and importers to be licensed to sell or import tobacco for resale in Alberta. Licensed wholesalers, licensed importers, and manufacturers in Alberta, supply tobacco to Alberta as the first step in the distribution chain. Tobacco tax collectors are required to collect and remit the tobacco tax to Tax and Revenue Administration (TRA). An importer is a person who imports or brings tobacco into Alberta for sale to a consumer or for resale. An importer is required to be licensed to bring product into Alberta for resale. Licensed importers are appointed as tobacco tax collectors, and are required to report and remit the tobacco tax on product imported into Alberta on a monthly basis, even if the return is nil. A wholesaler is a person, including a manufacturer, who sells, or offers for sale, tobacco for resale. Wholesalers may be appointed as either a tobacco tax collector or a non-collector. TRA will review each tobacco licence application to decide whether to appoint a wholesaler as either a tobacco tax collector or non-collector. The appointment is based on the activities conducted by the wholesaler (e.g., importing, exporting, who they acquire tobacco from, etc.). Licensed wholesalers appointed as tobacco tax collectors are required to report and remit the tobacco tax on product sold into Alberta on a monthly basis even if the return in nil. Bring, mail or fax your completed forms to TRA. TRA will send you a copy of a Tobacco Collector Agreement (the Agreement). Review the conditions outlined in the Agreement. An authorized signing representative must sign and date the document in the presence of a witness, who must also sign the Agreement. Bring, mail or fax your signed Agreement to TRA. You will receive an approval letter and a copy of the Agreement signed by a TRA representative by mail. Returns are due on the 28th day after the end of the month for each period. A penalty will be charged if you file your return late. Complete your tobacco tax return online using TRACS. Remit the tobacco tax owing on or before the 28th day of the month following the period end. Tobacco tax memo suppliers with Tax and Revenue Administration Client Self-Service (TRACS) accounts are able to submit tobacco tax memos electronically, formatted to TRA standards. A retailer is a person who purchases tobacco from a licensed wholesaler or licensed importer for sale to consumers. Alberta retailers are generally not required to register or be licensed with the Government of Alberta to sell tobacco unless they are located on a reserve or are a duty-free shop. All retailers are required to purchase tobacco tax-included from licensed wholesalers and importers. This includes black stock and Alberta unmarked tobacco product. Retailers located on a reserve must be registered as an AITE retailer. For more information on how to register as an AITE retailer, and how to apply for a refund when tobacco is sold to an eligible consumer, see the AITE page. Duty free shops must register by completing and submitting the Alberta Duty Free Shop Registration (form AT216) (PDF, 281 KB) to TRA. Complete and print the Tobacco Tax Refund Application (AT4771) (PDF, 294 KB). Bring, mail or fax your completed refund application to TRA. Documents that support your refund application may be requested. Refer to Information Circular TTA-5, Administration, for the types of documents that may be required to support your application. After your claim has been assessed, you will receive your refund by direct deposit or cheque. Complete an Application for Direct Deposit (AT4812) (PDF, 186 KB). Submit to TRA along with a copy of a “VOID” blank cheque. Funds will only be deposited into 1 bank account. A consumer must apply to TRA for a permit to possess more than the quantities noted above. To apply, a consumer must send a written request stating the reasons for requiring the excess quantities and what the tobacco will be used for. Alberta tobacco tax applies to tobacco imported into Alberta by residents returning to Alberta from outside Canada where the quantity of tobacco imported exceeds or does not qualify for the federal traveller’s customs exemption. For more information on the federal exemption, visit the Canada Border Services Agency (CBSA) website. Consumers bringing tobacco into Alberta that was purchased in another province or territory are required to report the importation and pay the Alberta tobacco tax to TRA within 10 days. When the consumer has been out of Alberta for more than 48 hours, the federal exemption limits may apply on cigarettes, tobacco sticks or manufactured tobacco if the product is stamped or marked federally or provincially. To report the importation, complete the Non Alberta Marked Tobacco Importation Return (AT208) (PDF, 306 KB) and submit to TRA. These documents are used to announce changes to the legislation administered by TRA, or changes to administrative policies and practices carried out by TRA. These notices are time-specific, and meant to be transitory in nature. The information may eventually be incorporated into other publications, such as information circulars or web content.